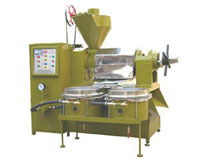 We offer fully tested, premium quality and cost effective Vegetable Oil Press with different crushing capacity. These Vegetable Oil Press require less maintenance and are easy to operate. In addition, use of latest technology helps in offering energy efficient expellers in the market. This oil press machine is suitable for small scale oil pressing owner. The oil is pured after pressing automatically. 3. 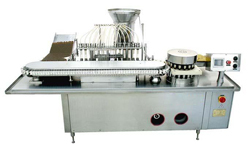 Before pressing, some parts of the presser ,such as, press chamber, press screw and press ring will be pre-heated.During pressing,the press can filter the oil in due time. 5. It is composed of feeder ,gearbox, pressing cage,screw shaft and machine stand. This vegetable oil press is in accordance with the standard for small scale oil mill. 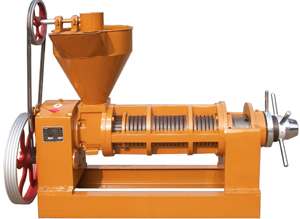 6.This kind of screw vegetable oil press utilizes the screw shaft whcih is set-up with different styles of screw and rotate when machine is running to push the material into chamber.Then oil is separated out through the extrusion of pressing worm and pressing ring. You are welcomed to send email if you want to get more information of our vegetable oil press and more support from us! We are always ready to serve you!